Is there a classic houseware product more recognizably Canadian than the Hudson Bay Company blanket? We’ve been seeing the signature combination of green, red, yellow and blue on a white background showing up in projects for decades, but some designers have been finding new ways to reinvent the company’s iconic blanket into custom interiors that feel fresh and unique. Here are a few successful design ideas I recently came across. This basement, designed by Thornhill, Ontario firm Avalon Interiors, incorporates the primary colours of the pattern into a custom upholstered seating sectional, creating a truly unique Canadiana lower living level. While this Portland, Maine project designed by Landing Design and Development may not be located in Canada, the use of the Hudson Bay blanket on an upholstered wingback chair showcases a distinct Canadian pride. The Vancouver based Good Space Design Group incorporated the signature blanket in a monochromatic palette to enhance this downtown Vancouver condominium. How fantastic to see how the monochromatic pattern showcases Canada, while complimenting a contemporary setting. 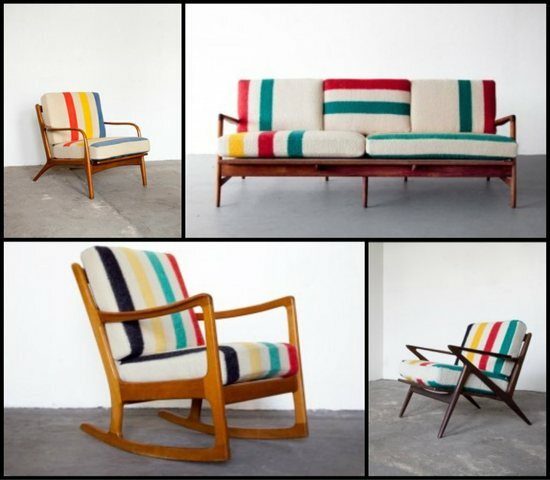 These vintage furnishings were being sold by a Brooklyn firm called Sit and Read! There are loads of creative ways to integrate this classic patterned blanket into home furnishings. All other images courtesy of Houzz via each firm’s respective pages.